Most brands and businesses face the same challenge: how to increase website traffic organically. Even the most popular sites are constantly trying to obtain more followers and increase visits to their website. Generating organic website traffic takes time and effort, but with proper execution, your brand will reap the rewards of all that hard work. Organic website traffic is the most coveted type of traffic by digital marketers. Organic traffic costs a brand nothing, is entirely dependent on SEO practices and often converts into more high-quality leads. Paid traffic can be successful in terms of sheer numbers, but it is more volatile because results are hardly guaranteed. The different forms of paid website traffic include clickbait, spamming users, pay-per-click (PPC) advertisements and other methods. Arguably the most effective way to increase website traffic organically is to be active on social media platforms. These days, consumers expect to find their favorite brands and companies on social media and will readily follow such accounts. Engaging on social media allows companies to build awareness, gain followers and showcase the best the brand has to offer. Make sure your content contains social sharing buttons and maintain an active presence on social media. Like, follow, share and comment on other’s posts and update your social media accounts often with new, relevant material to attract readers and increase website traffic. Creating content is another crucial tactic in growing website traffic organically. But creating noteworthy content is harder than it used to be. With so much information on the internet, you need to make sure your content offers something your competition doesn’t, is formatted to accommodate mobile, and poised for social sharing. A recent study shows that 6 in 10 internet users don’t read beyond an article’s headline. This means that your content’s headline carries colossal weight and your efforts will be well spent on an engaging headline. Content that contains infographics and other images are more noteworthy than those without such elements. Social media influencers have an incredible amount of marketing power. Finding the influencers in your industry and building relationships with them can have advantages. Because of their massive social following, influencers can send a surge of online followers and traffic to any brand they positively mention. Engage with the social media influencers and internet celebrities in your space to create a reciprocal, ongoing relationship. Build the foundation of a professional connection by highlighting their stories; feature them in a blog post as an expert in their field or share their articles and updates. Create good rapport and stay engaged so you can continue working together in the future. Adding proper metadata to your website’s pages is one of the most important things you can do to boost website traffic and search engine optimization (SEO) value. Metadata is additional information about your web pages. It ensures the pages are located and navigated by search engines and includes title, keyword, and description. In most content management systems, you can add the metadata in HTML or download a plugin application like Yoast SEO. Be sure that each and every page of your website has the proper metadata, even previously published pages. Link building is a great way to boost the value of your website’s SEO as well as increase traffic to your website. When a website links to your own, not only is it a signal to search engines that your site is reputable, it also places your brand in front of a different target market. Brand mentions are a great place to start link building. Set up an alert to track your online mentions and then reach out to those websites to request the addition of the hyperlink if they haven’t already done so. Beef up your link building efforts by reciprocating with external links, creating partnerships with other brands and getting involved in your community. Using keywords to optimize your web content is important, but making sure you’re using the correct keywords is even more important. Without proper research, your keyword efforts could be all for nothing. Instead of using the most popular search terms as keywords, which will be hard to rank at all for, choose specific phrases and “long tail” keywords. There are several free online tools to help you determine the best long tail keywords for your pages, such as Answer the Public and Google Trends. Website analytics tools are extremely beneficial. These metrics track the demographics of visitors to your website. Many analytics tools are able to determine where your website visitors come from, what keyword was searched and how long they spend on certain pages. Use this measurable data to fine tune your content for your target market. Understanding your audience lays the groundwork for increasing website traffic organically. A common myth in the digital marketing industry is that blog posts have a short shelf life. Repurposing existing content is a smart way to increase readership, build brand awareness and drive traffic to your website. There are several ways to recycle old content, but make sure that there is new, added value before you republished it. Try your hand at recycling content by reformatting it into a different medium, or updating the original post to include new information. But be sure you don’t change the original URL—doing so can impact web authority. Guest blogging is an effective way to generate website traffic. Make sure that you have established yourself as a credible authority on your own website by publishing several blog posts on an industry topic. Then reach out to other established brands that have higher page ranking and more website traffic than your own. Within your guest blogging articles, be sure to link back to your website. Contributing content to other highly regarded websites lends credibility to your brand’s website and adds to your page ranking in search engines. Shortcuts and workarounds are great, sometimes. Avoid applications and tools that promise quick results. Often these tools are meant to trick search engines into granting a higher page rank, which will result in a ranking penalty or worse. Plus Google’s constantly changing algorithms render these efforts useless anyway. 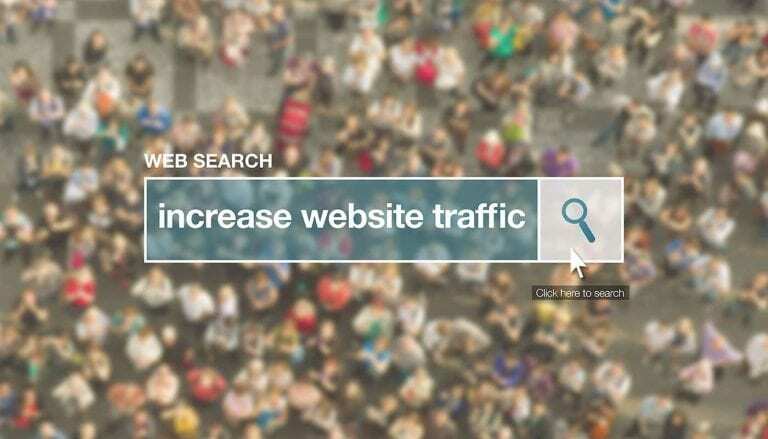 Increasing website traffic organically is just one piece of the digital marketing puzzle. If your brand is struggling with a marketing strategy, contact Front Porch Solutions. Our team offers high-end, conversion-driven web services including development, SEO, social media, PPC and more.